Words can’t describe the feeling of the week(s) following a fabulous vacation in the middle of a Wisconsin winter. But I’d be willing to bet that anyone who has experienced this feeling knows exactly what I’m talking about. Holding back tears while unpacking, relishing in the memories created while realizing that you’re back in the real world, ugh…it’s just too much to handle. I’ve already starting watching for cheap flights even though I know another vacation isn’t in my near future. I’ve looked through my vacation photos over and over again, I’ve talked about my trip to as many people that will listen, and now…I’m going to re-live it right here on my blog! So here goes! 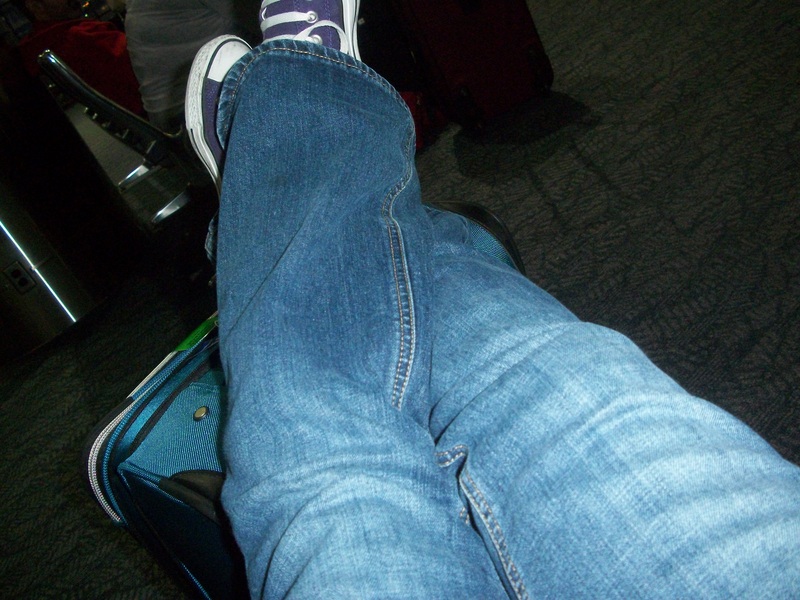 Feet up, waiting to board the plane. I'm on vacation! We booked our trip back in October, through Expedia. Our original flight was to leave Milwaukee at 10:30am with a one hour layover in Houston, getting us to the airport in Cancun around 4:30pm. United/Continental changed our flight numerous times, finally bumping the departure time from MKE to 7:30am! This also meant that our one hour layover in Houston turned to four. Not happy but what could we do? Well, what we did was wake up at 3am in Madison and head to Milwaukee. Hubby woke up with the flu. For real. We had to pull over twice on the way to the airport for him to toss his cookies. I felt so horrible for him! He avoided eating or drinking anything until we got to Houston to make sure he wouldn’t need to make any emergency trips to the tiny airplane restroom. He had a few bites of a $9 bowl of chicken noodle soup from the Fox Sports Sky Bar before finding himself a comfy spot to endure our 4 hour layover. All went well with flights and we arrived in Cancun on time. My friend, Julie, and our shuttle service were waiting for us when we make it through customs. We made a quick stop at the 7-11 for refreshments and we were off to our resort! These Japoneses nuts are SOOO good! I have no idea what makes them so great but I did notice MSG in the ingredient list and decided to investigate no further. I always have to get a bag of these the second I step foot in a Mexican tienda. This Sol con Clamato was new to me and oh so delicious. My family is a huge fan of Clamato juice in Bloody Mary’s, which is technically considered a Bloody Caesar. For as long as I can remember, my dad has been mixing light beer with Clamato juice for a nice, refreshing post-work beverage. He sometimes adds a splash of Tabasco or pepper so when Budweiser came out with Chelada, my dad was all over it. He and my hubby just love the stuff. Even when they don’t buy the cans of it, they mix their own at home. Clamato juice is also HUGELY popular in Mexico so there are tons of drinks similar to chelada or Bloody Mary, containing Clamato. One of our favorites is called “Ojo Rojo”. You’ll see a bit of that later. 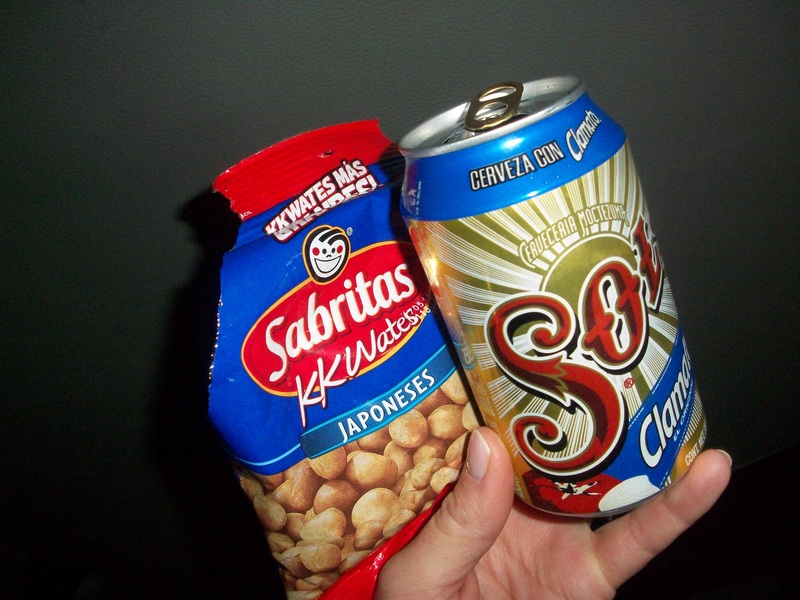 Needless to say, Japoneses and Sol con Clamato were the perfect snack for the trip to our resort, which was about a 45-minute ride. We arrived at our resort after dark, checked in, took a little tour of the grounds, and then headed up to our room. I had stayed at this particular resort once before, when it first opened, and so much had changed over the past 5 years. Hubby was feeling a bit better but not great so we got settled into our room and then he headed to bed. I had a couple of drinks with our friends in their room and then also called it an early night while they two of them explored the grounds of the resort, took a midnight swim in the sea, and rolled back into their room (right above ours) around 1 am. Since there aren’t any other pics from our first day (well, half day) I thought I’d share a bit of info about our resort. 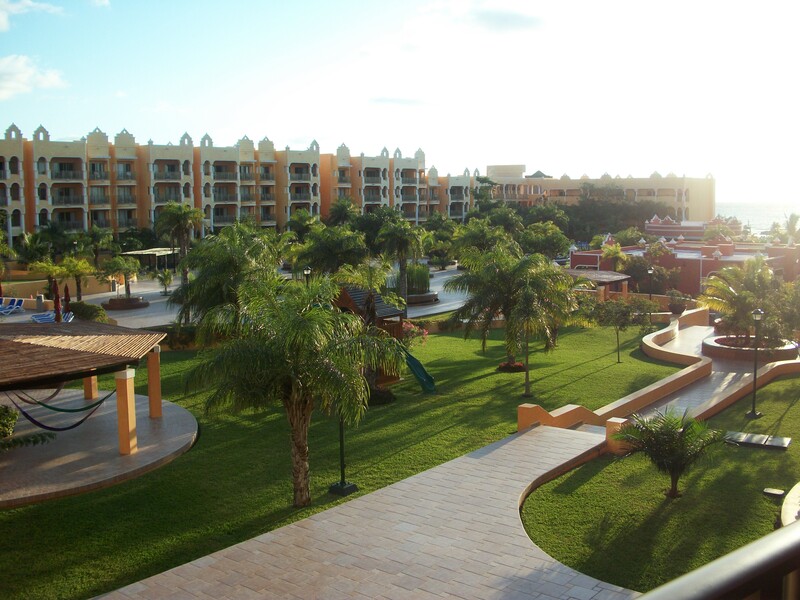 The Royal Haciendas is one of 6 Royal Resorts in the Cancun/Riviera Maya area of Mexico. The Royal Resorts are gorgeous, perfectly-maintained, “condotels”, with all of the amenities of all-inclusive resorts, minus the all-inclusive price tag. There are restaurants, bars, and grocery stores on-site that you choose to go to if you wish, but since you pay only for your room ahead of time, and not for an all-inclusive food/beverage plan, there’s no reason to feel tied down to eating at your resort. Since we’re so familiar with the Playa del Carmen area, we have tons of places we love to frequent so the idea of a beautiful resort without an all-inclusive plan works out great for us. We don’t own a timeshare, but usually rent from owners at the resort for a fraction of what the resort itself rents the rooms for. As a guest, you get all of the same service, amenities, treatment that you would as a member. The Royal Resorts are PHENOM! We’ve stayed numerous other places in Playa del Carmen but I will always recommend The Royal Haciendas. Previous Post Heart Healthy Cookies?